When John and Peter Delmonico opened their first restaurant in New York City in 1827, they were knocking on a well-bolted door. In a time when wealthy Americans dined and entertained in the privacy of their own opulent dining rooms, public restaurants offered common fare to the working class. The Delmonicos intended to change that. Opening their café at 23 William Street, they served, instead of tavern food, the cakes, fine wines and ices that affluent New Yorkers had grown to expect in Paris and Vienna. Four years later the brothers expanded next door, opening a full restaurant serving fine French and Italian cuisine. Increasingly New York’s gentry patronized the restaurant. When the building was destroyed in the infamous Fire of 1835 that ravaged most of the Wall Street area, the brothers purchased the odd triangular lot at the Beaver and South William Streets. Backed by eight years of success, they erected an stylish four-story structure. 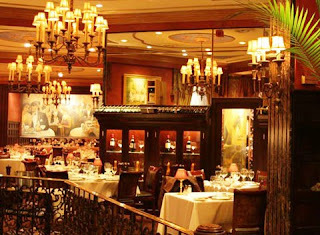 The name Delmonico’s became synonymous with upper class dining; it was the place for dignitaries – such as the visiting Prince Louis Napoleon -- and the wealthy to be seen. Four columns, reportedly from the doorway of a Pompeian villa, flanked the marble entrance portico. 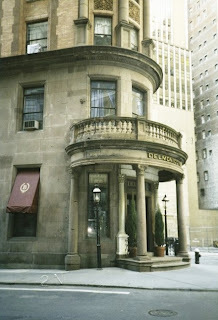 The New York Sun wrote that Delmonico’s had provided “places not merely to dine at, but to talk about, to take foreigners to, places to be proud of, which make the city attractive the world over.” From its kitchens the renowned chef, Charles Ranhofer, created culinary delicacies such as Lobster Newberg, Delmonico Steak, Eggs Benedict and Baked Alaska. The menu offered 47 veal dishes, 12 types of boiled beef, and 50 fish dishes. By 1890 Delmonico’s was the premier eatery in the nation and the Delmonico family had opened no fewer than six other Delmonico’s throughout the city; yet more space was necessary in the old Beaver Street location. Charles Delmonico, grand nephew of the founders, razed their building and commissioned James Brown Lord to design a new, more impressive structure. Delmonico's in 1895 -- "King's Photographic Views of New York"
The article explained that, while Charlie Delmonico wished to put the box in the corner stone at the South William Street side, the builder David King refused. “The coins found in Solomon’s temple were found under the northeast corner,” argued King. Not wanting to tempt fate nor bad luck, Delmonico placed the box in the northeast corner. Lord emphasized the dramatic rounded corner, making it the focal point of the structure. He fashioned a rich entrance from a salvaged cornice from the former building, as well as two of the Pompeian columns (touching the columns became a tradition of good luck for knowing patrons). Brick, stone, terra cotta panels and copper were combined to create a visually stunning edifice on an odd slice of land. Following Charles Delmonico’s death in 1901 management of the restaurant changed hands within the family twice until, in the 1910s, family squabbles over expenses and profitability began straining relations. In 1917 family members agreed to sell the building. The American Merchant Marine Insurance Company purchased it for $500,000 and, shortly thereafter, the restaurant ceased operation. The grand dining areas on the first and second floors, once the place of debutante dinners and society wedding breakfasts, was cut up into office space. Oaken desks and filing cabinets now sat where Andrew Carnegie and Diamond Jim Brady once dined on oysters and brokered deals. 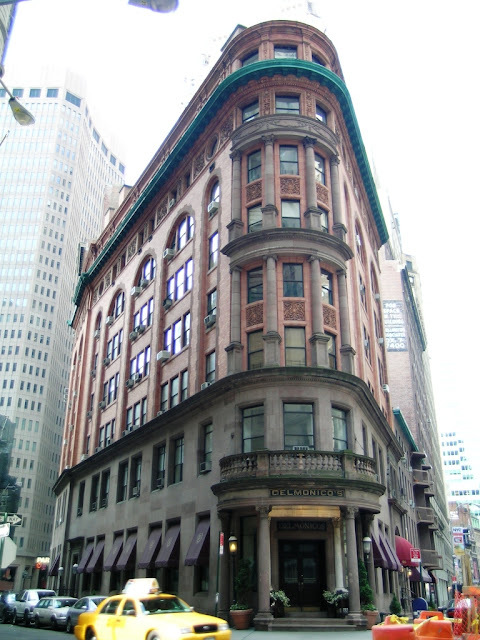 Delmonico’s became “The Merchant Marine House,” home to shipping businesses and related insurance companies. Three years later the building was sold again, for a profitable $1,250,000, to the Insurance Company of North America. Oscar Tucci intended to change that. Taking advantage of the culinary void and the well-recognized and respected name, he opened Oscar’s Oldelmonico Restaurant in the lower and first floors. Tucci ran his restaurant as a reimbodiment of the former restaurant. It was a success. In 1935 he expanded to the second floor and the first floor of 48-54 Beaver Street next door (both buildings being owned by the City Bank Farmers Trust Company by now). Later, the reincarnation was complete when Tucci changed the name to Delmonico’s Restaurant. When in 1985, ten years before achieving landmark status, the combined buildings were sold to 56 Beaver-Wall Street Inc. the original windows were replaced and other slight modifications were made. Time Equities, Inc. purchased in November 1995 at foreclosure and within a year had converted the upper floors into 40 residential units. Today, Delmonico’s is back in business on the lower floors as The Original Delmonico’s Steakhouse Restaurant, serving many of the dishes that made the restaurant famous.